Doesn't matter if it's food or clothing... I love a scallop. 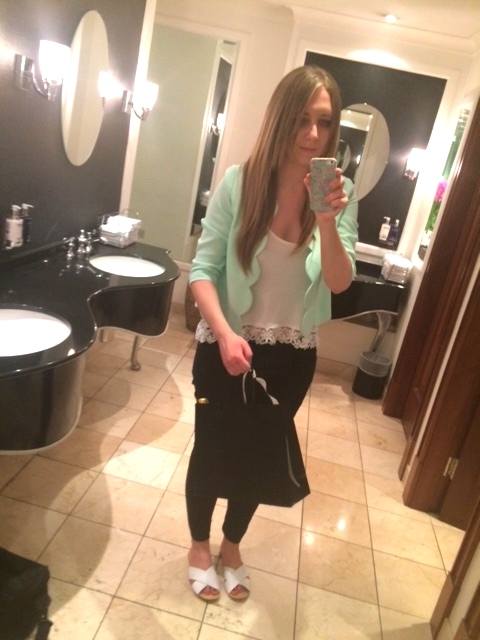 This mint coloured scallop blazer from Primark is the latest addition to my wardrobe. As is typical of Primark, they didn't have any of the smaller sizes left... so I went a size up. But sizing up is no bad thing. The slightly over sized nature of the blazer means it looks lovely propped on your shoulders in that wanky way that you'll see all over Instagram / Pinterest / LookBook. This mint sort of hue is the perfect summer shade and looks great worn with ultra white clothing and a tan. The latter I do not have.... but even so, it still manages to brighten my skin tone up a little - so don't feel like you have to avoid mint if you're a ghost pale like me! Just a little sneak peak of what I wore to the hotel in my last post. I wore these New Look white sliders during the day and packed a pair of heels in my bag for the hotel later. At least I thought I did... Lucy fail! such a cute jacket, i can't believe it's from primark! Your mint blazer is my everything ! Looooove that colour !